In the last chapter, we created an IAM user so that our AWS CLI can operate on our account without using the AWS Console. But the IAM concept is used very frequently when dealing with security for AWS services, so it is worth understanding it in a bit more detail. Unfortunately, IAM is made up of a lot of different parts and it can be very confusing for folks that first come across it. In this chapter we are going to take a look at IAM and its concepts in a bit more detail. Let’s start with the official definition of IAM. The first thing to notice here is that IAM is a service just like all the other services that AWS has. But in some ways it helps bring them all together in a secure way. IAM is made up of a few different parts, so let’s start by looking at the first and most basic one. 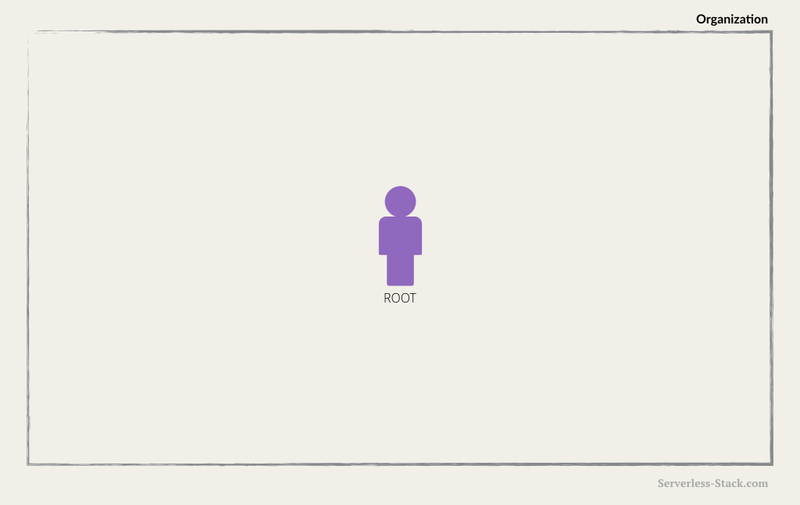 When you first create an AWS account, you are the root user. The email address and password you used to create the account is called your root account credentials. You can use them to sign in to the AWS Management Console. When you do, you have complete, unrestricted access to all resources in your AWS account, including access to your billing information and the ability to change your password. Though it is not a good practice to regularly access your account with this level of access, it is not a problem when you are the only person who works in your account. However, when another person needs to access and manage your AWS account, you definitely don’t want to give out your root credentials. Instead you create an IAM user. An IAM user consists of a name, a password to sign into the AWS Management Console, and up to two access keys that can be used with the API or CLI. By default, users can’t access anything in your account. You grant permissions to a user by creating a policy and attaching the policy to the user. You can grant one or more of these policies to restrict what the user can and cannot access. An IAM policy is a rule or set of rules defining the operations allowed/denied to be performed on an AWS resource. Attaching a managed policy. AWS provides a list of pre-defined policies such as AmazonS3ReadOnlyAccess. Attaching an inline policy. An inline policy is a custom policy created by hand. Adding the user to a group that has appropriate permission policies attached. We’ll look at groups in detail below. Cloning the permission of an existing IAM user. As an example, here is a policy that grants all operations to all S3 buckets. And here is a policy that grants more granular access, only allowing retrieval of files prefixed by the string Bobs- in the bucket called Hello-bucket. We are using S3 resources in the above examples. But a policy looks similar for any of the AWS services. It just depends on the resource ARN for Resource property. An ARN is an identifier for a resource in AWS and we’ll look at it in more detail in the next chapter. We also add the corresponding service actions and condition context keys in Action and Condition property. You can find all the available AWS Service actions and condition context keys for use in IAM Policies here. 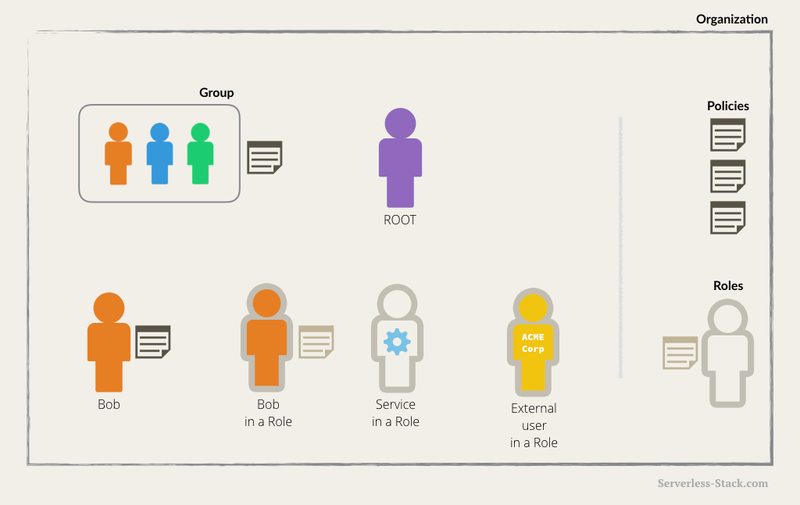 Aside from attaching a policy to a user, you can attach them to a role or a group. Sometimes your AWS resources need to access other resources in your account. For example, you have a Lambda function that queries your DynamoDB to retrieve some data, process it, and then send Bob an email with the results. In this case, we want Lambda to only be able to make read queries so it does not change the database by mistake. We also want to restrict Lambda to be able to email Bob so it does not spam other people. While this could be done by creating an IAM user and putting the user’s credentials to the Lambda function or embed the credentials in the Lambda code, this is just not secure. If somebody was to get hold of these credentials, they could make those calls on your behalf. This is where IAM role comes in to play. An IAM role is very similar to a user, in that it is an identity with permission policies that determine what the identity can and cannot do in AWS. However, a role does not have any credentials (password or access keys) associated with it. Instead of being uniquely associated with one person, a role can be taken on by anyone who needs it. In this case, the Lambda function will be assigned with a role to temporarily take on the permission. 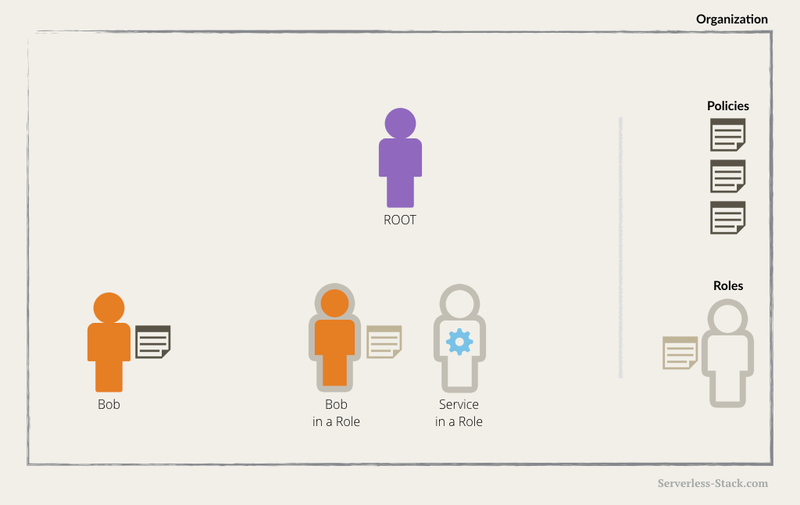 Roles can be applied to users as well. In this case, the user is taking on the policy set for the IAM role. This is useful for cases where a user is wearing multiple “hats” in the organization. Roles make this easy since you only need to create these roles once and they can be re-used for anybody else that wants to take it on. 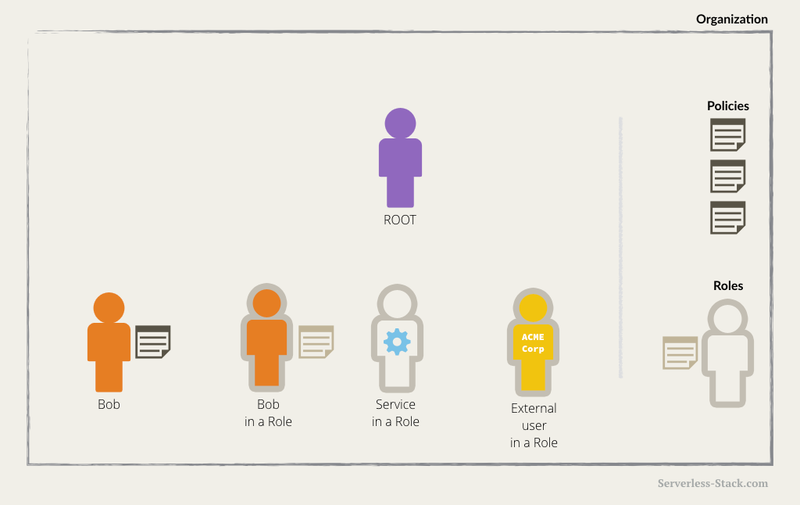 You can also have a role tied to the ARN of a user from a different organization. 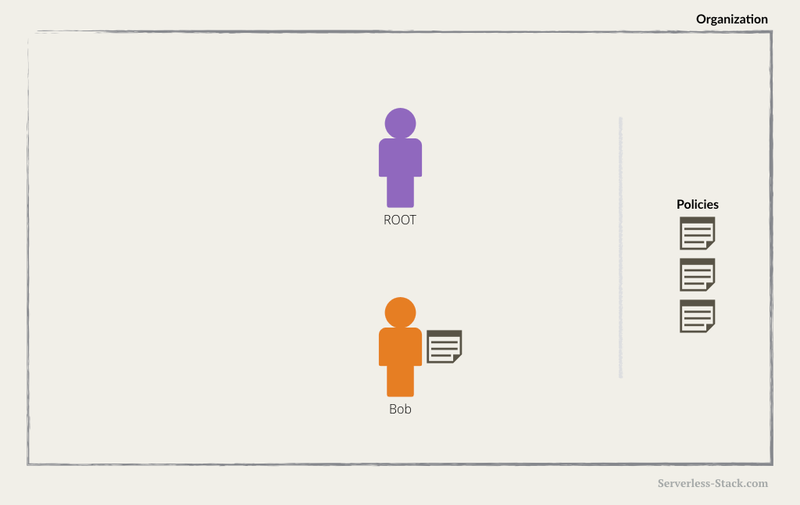 This allows the external user to assume that role as a part of your organization. This is typically used when you have a third party service that is acting on your AWS Organization. 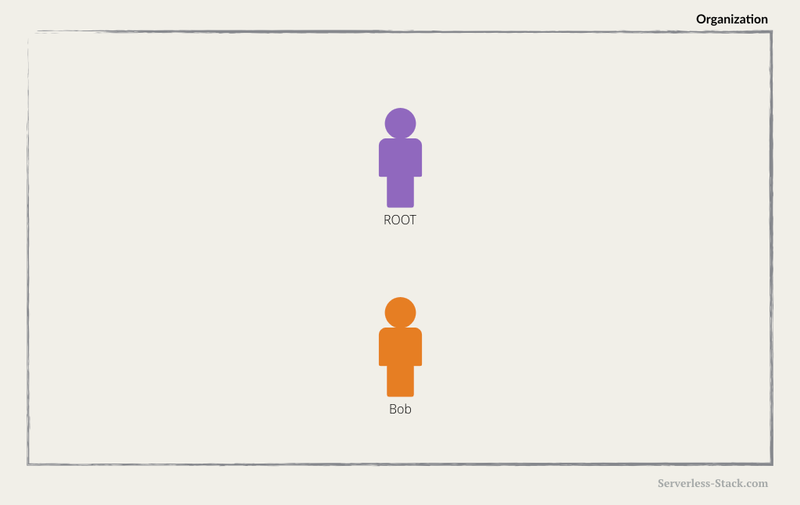 You’ll be asked to create a Cross-Account IAM Role and add the external user as a Trust Relationship. 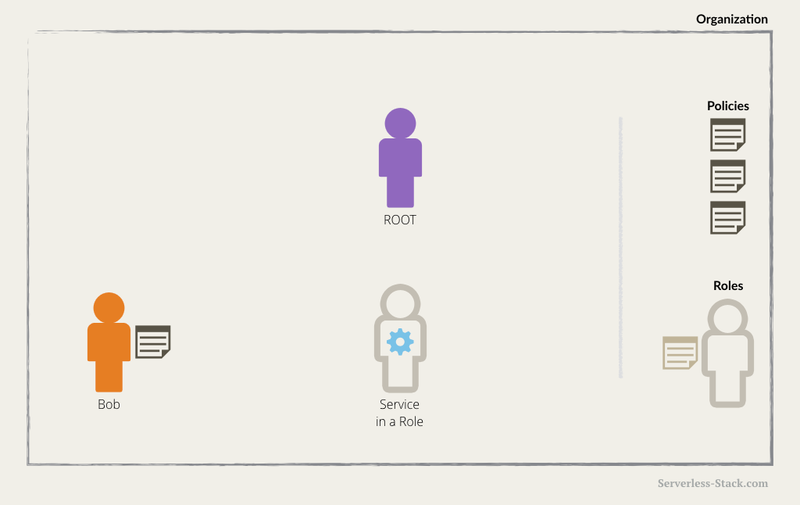 The Trust Relationship is telling AWS that the specified external user can assume this role. An IAM group is simply a collection of IAM users. You can use groups to specify permissions for a collection of users, which can make those permissions easier to manage for those users. For example, you could have a group called Admins and give that group the types of permissions that administrators typically need. Any user in that group automatically has the permissions that are assigned to the group. If a new user joins your organization and should have administrator privileges, you can assign the appropriate permissions by adding the user to that group. Similarly, if a person changes jobs in your organization, instead of editing that user’s permissions, you can remove him or her from the old groups and add him or her to the appropriate new groups. This should give you a quick idea of IAM and some of its concepts. We will be referring to a few of these in the coming chapters. Next let’s quickly look at another AWS concept; the ARN.